Well, we survived the rain and the wind without any loss of power. Today the weather was much quieter. And colder. With a few snowflakes. I enjoyed a few hours of quiet this morning while my guys slept. 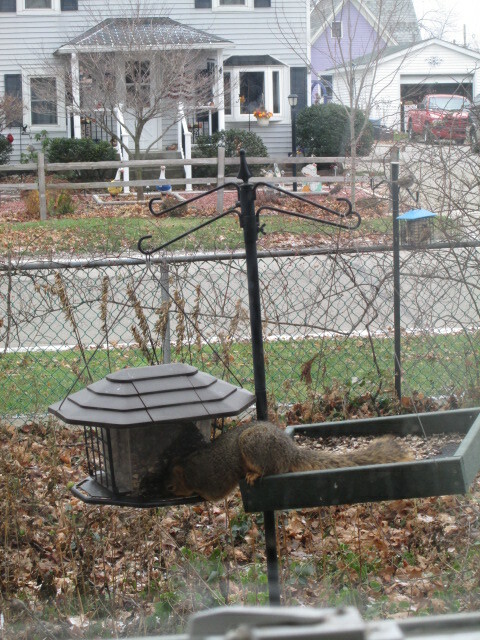 I made a pot of coffee, browsed my favorite places on my laptop, cuddled some cats, and watched the squirrel sit in the tray feeder while he ate sunflower seeds from another. 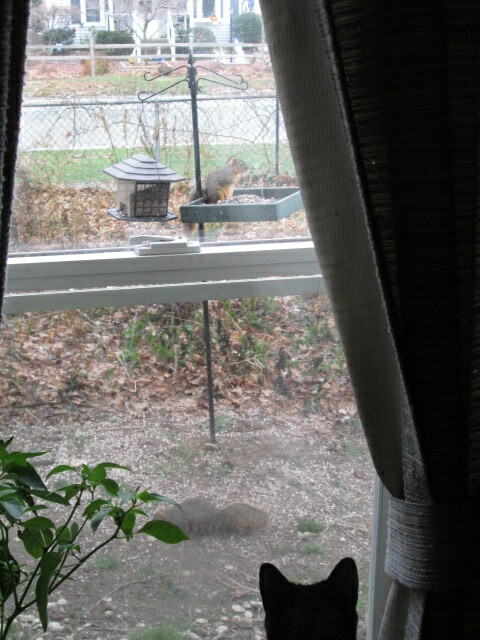 When I went to the window to take this picture, I saw another squirrel eating seeds from the ground. Then I noticed a third squirrel heading toward the feeders. They were all very big and super fat–as if God had photo-shopped them. It’s probably because they have been feasting at our feeders. I know there are people who get upset when the squirrels eat from the feeders, but I enjoy watching all the wildlife that comes into our yard. Little Bear enjoys them too. Thanksgiving is on Thursday–two days from now. For several weeks we have been discussing how to celebrate this year. We all agreed that we wanted a quiet Thanksgiving without much fuss. We all wanted to enjoy a Thanksgiving meal, but we discussed whether we wanted to stay at home or go to a restaurant. Staying at home had a lot of appeal, but that would mean cooking and cleanup. Going to a restaurant had an appeal because we could enjoy the dinner without any of the work. JJ felt that maybe we shouldn’t eat out on Thanksgiving because there is a counter-movement against shopping on Thanksgiving so people can spend the day with their families. I said that while I think that is admirable, our family also needs to have some fun…and it’s not as if it is Shabbat, which God said specifically people were not to work or cause others to work. Besides, I have a friend who used to be a waitress long ago and she said they always looked forward to working on the holidays because people were nice, and gave large tips, and everyone ordered turkey dinners which made waitressing easy. The problem was where would we go? We have never eaten Thanksgiving dinner at a restaurant before. It googled “restaurants opened on thanksgiving” and learned that there aren’t many. My first thought was to dine at a nice restaurant in Frankenmuth, a quaint town with a Bavarian flavor. However, it would have taken several hours of driving to get there (and back again) so we decided against it. Next, I suggested a fancy restaurant only about 20 minutes from our home, but we voted against it because we thought we might have to dress up…and we didn’t want to. EJ suggested a restaurant he had heard about in which strangers are seated together at tables to encourage interaction. That might be a fun experience–some day when we are feeling adventurous–but we didn’t want to do that this time. We finally decided we’d go to Denny’s. JJ groaned, “Not Denny’s! That’s so pathetic!” He was thinking of the scene in the movie The Santa Clause. He is also afraid we will make Santa Clause movie jokes. I said that it would be fun…and we would only make jokes if the waitress’ name is Judy. Although, I must say that I will be slightly disappointed if they are not out of eggnog, chocolate milk, and apple pie. Eating our Thanksgiving Dinner at a restaurant means that there will be no leftovers, which is a favorite part of Thanksgiving. So this morning EJ and I went to the grocery store this morning to buy a turkey, cranberry sauce, rolls, and a pumpkin pie. Usually we make them homemade, but we want the leftovers without the work. Actually, this was the second turkey that we bought. We bought the first when we went shopping on Sunday. Turkey is on sale right now, so we bought one to eat now and put the other in the freezer to enjoy later. After I read your comment, I spent a little time learning which holidays the Netherlands celebrates. I think that the customs of different countries and people are fascinating. I know it is late notice but Bob and I will be serving Thanksgiving dinner at our church St. Peter’s in E.R. Our family parish has done this for the last number of years, celebrating the season with those who would be alone or just do not want to cook the big dinner. We would love for you to join all of us, we will be serving our friends and family from noon til 3pm. Now the reason we are involved is because all of our children will be with their in laws and next year will be with us. And there is no charge for this dinner all is put on by the people of the parish. Again we would love to have you join us.